Happy Monday! After a rather intense week filled with lots of emotional ups and downs, I have been listening to Christmas music on repeat and it has absolutely been helping me feel in a better mood, and we even began doing a small bit of Christmas decorating around the house this weekend (which was shocking to me, considering how Adam usually hates the idea of anything Christmas related before Thanksgiving). Last week, we went out and found some gorgeous Christmas candle votives and started decorating our tables with beautiful silver and gold holiday accents and candles. In the morning, while we were decorating, I grabbed our holiday glasses from storage and decorated our bar cart with our holiday barware. While Adam made us some brunch, I prepared this holiday, winter berries mocktail recipe for us to enjoy! 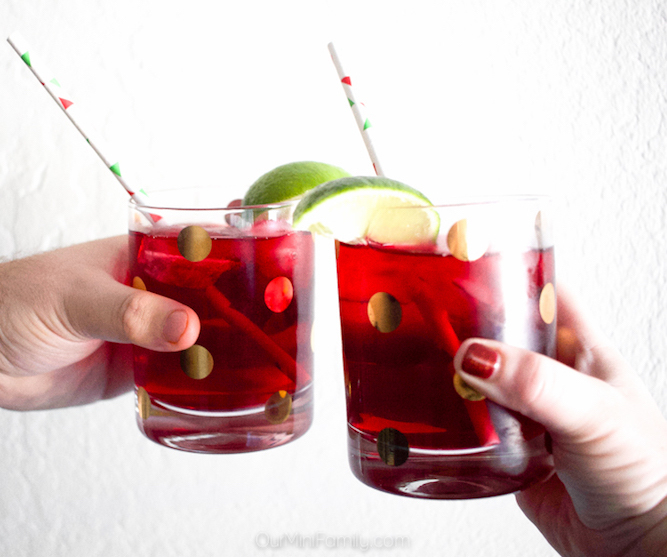 This holiday mocktail recipe is a simple and delicious drink that the whole family can enjoy together! 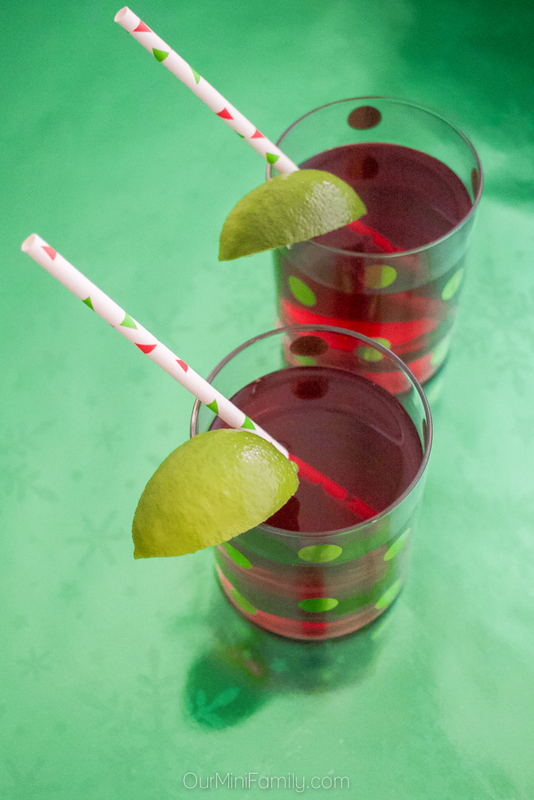 For this Christmas-inspired drink, we used cranberry juice cocktail, freshly squeezed lime juice, ice, and Sparkling Ice Black Raspberry. 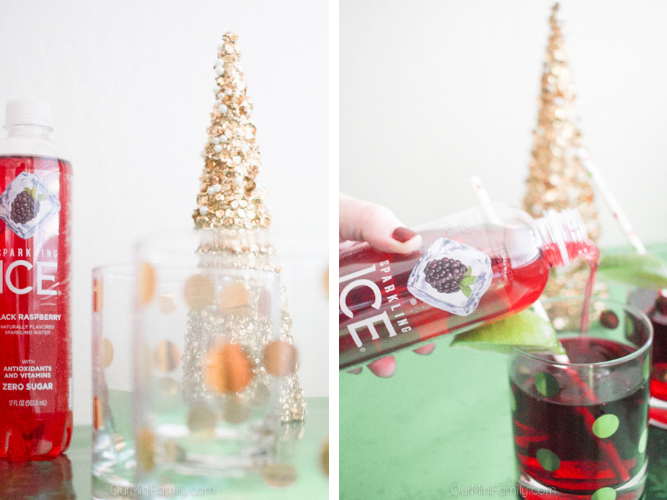 In the past, I have shared how much Adam and I enjoy Sparkling Ice and all of the different flavors that they have (see more ideas in our cactus party ideas blog post and our last-minute pool party essentials post!) They have all kinds of different flavors to try, and we can even stock up on them and have them shipped right to our door from Amazon.com! In a glass, combine the cranberry juice cocktail and Sparkling Ice Black Raspberry. Slice a lime into quarters, and squeeze a quarter of a lime into the glass. Stir everything with a straw, and add ice. Serve and enjoy! 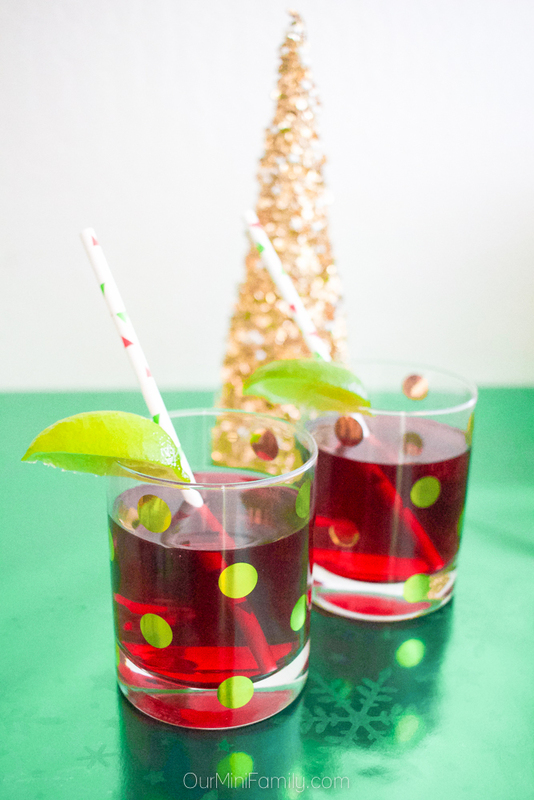 Don't forget to save this Christmas mocktail to Pinterest and Facebook! Always nice to have a refreshing drink with out any alcohol involved for those who prefer not to drink. Love the color. This is definitely a fun one for everybody in the family to drink on Thanksgiving. I think I will have this one as a choice for people. Yes please! I need to make these for sure. I love sipping on a tasty drink during the holidays. Cranberry juice is so tasty. Oh this mocktail sounds so fun and delicious. I would really love to try this recipe one day. Perfect for a holiday party!! OO this looks tasty and perfect for christmas. I am all for a festive mocktail. Oh, this sounds really good. I love having a fancy mocktail available at parties for people who don't drink. This sounds really good. I haven't made mocktails in years. I'll have to give this one a try. This looks so refreshing! I can’t wait to make this, this holiday season for my friends and family. We love Sparkling Ice drinks too! So many delish flavors. This holiday drink looks so good too! I'm a big fan of the Sparkling Ice waters. I am in love with those polka dotted glasses. Where can I find them? The glasses are Kate Spade by Lennox! I believe they're available at Nordstrom.com! I'm all about a good mocktail (or cocktail!) and this looks really good!! I need to try this ASAP!! I'm not a drinker but this would make a great option for our holiday dinner. Definitely bookmarking! This was a very coloful drink perfectly fits on Christmas and Nw Year's celebration. One thing I look forward for holidays good food and refreshing drinks like this. I don't drink so I really appreciate that the recipe is for a mocktail (and that it sounds delicious!) 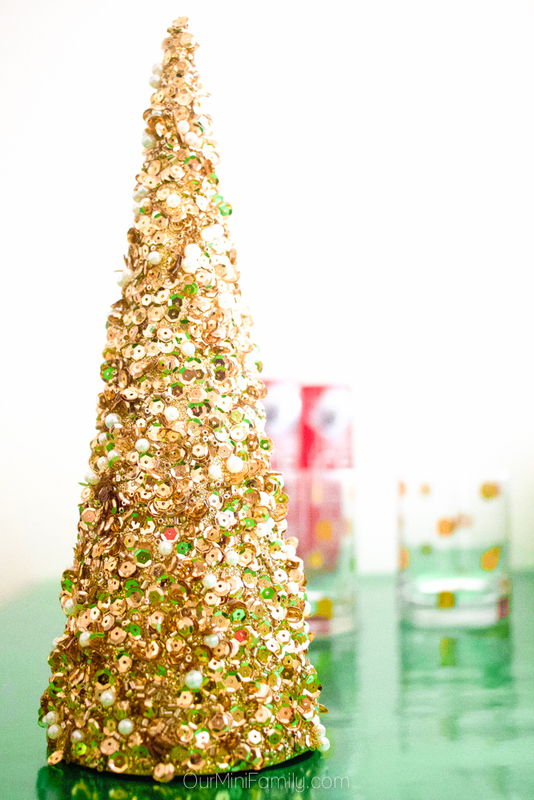 I also love your sequin tree and how it reflects color. Hoping for a better week ahead for you. This mocktail sounds really nice, I would like to try it, love the color and suits perfectly for holidays get together. Wow, this is so nice. I would love to try this out and see if me and my husband would love this. Perfect for some intimate bonding at home.